Thread: Could it be...another sighting?? I couldn't let Slick have ALL the fun. It's on now. Cool! !, did you get a second hand one also?? I did...and I took along with me to the place I took my Jeep today, so I decided to get it out and get it a little muddy already. I was going to buy a brand new one but I was watching RCC and this one had a list of upgrades done to it that I could not pass up for the price! I did notice some clicking when it was in a bind and trying to go in reverse, so it does have some work that needs to be done to it but it will definitely be a fun basher for now! Oh this is going to be fun! It's a trifecta now! Didn't know you had one. We are all so used to crawling slow, this could get really interesting. Yepper.. Got mine in trade, off RCC.. Lol.. It's a fun ride for sure! I've only got to run it in the snow, so far..
Just got some new packs for it. The old packs where tired..
Maybe we can do some fun running at the comp on the 12th!? I will have it with me, but there isn't a ton of room there to run them. Parking lot?? So my twin hammers has yeti electronics does that count? heck yea! If we can get all four of us together, we would have a blast! Started tearing into this thing a little bit today. 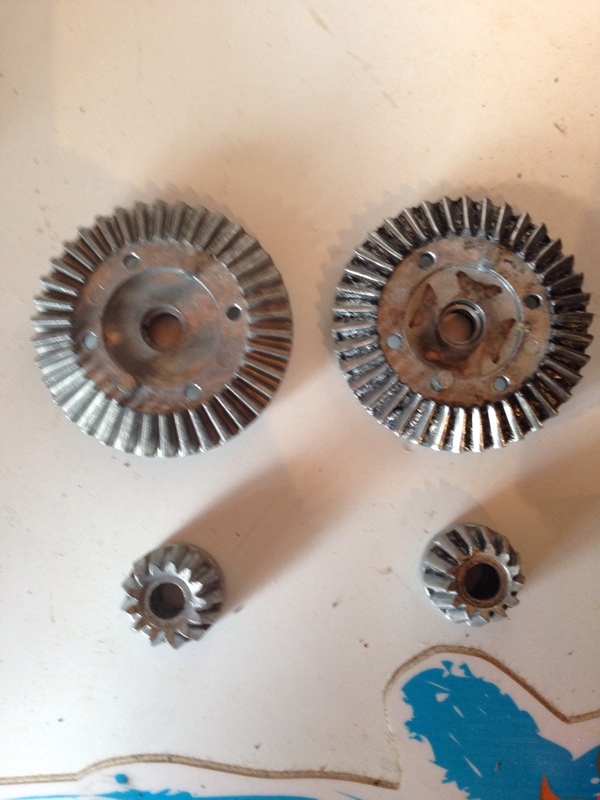 The gears in the rear were destroyed! Got that all fixed up. Here's some pics of old vs new. I also started changing out the servo for a better one and found more problems with the steering. Cracked bell housing I believe it is. Time to keep fixing. Feedback Buttons provided by Advanced Post Thanks / Like v3.1.7 (Lite) - vBulletin Mods & Addons Copyright © 2019 DragonByte Technologies Ltd. Runs best on HiVelocity Hosting. Site hosting and design by New Ideas Co.